Israel Police make clear they will not object to the early release of former Prime Minister. The Israel Police has made clear that they will not object to the early release from prison of former Prime Minister Ehud Olmert, Channel 2 News reported on Sunday. The parole board of the Israel Prison Service is scheduled to meet in two weeks to discuss a possible early release for Olmert. The Prisoner Rehabilitation Authority has formulated a rehabilitation plan for Olmert, according to which upon leaving prison he will volunteer at the Leket Israel organization, which collects food for the poor. The former Prime Minister will be required to continue with the treatment he has been receiving in prison even during his rehabilitation. The Israel Prison Service sanctioned Olmert two weeks ago, depriving him of vacations, visits, and the use of a public phone until further notice. 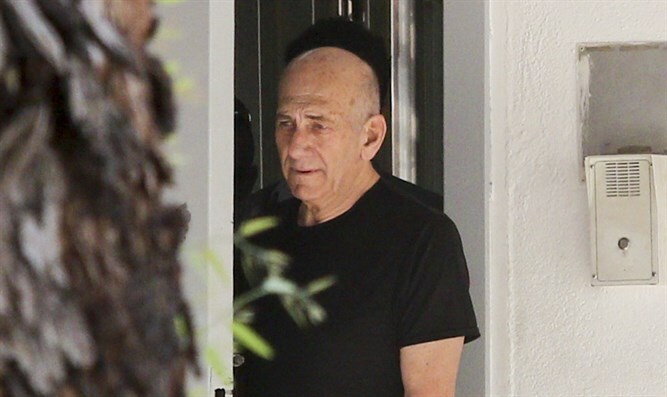 The sanctions came after one of Olmert's lawyers was caught with classified documents in his possession as he left the prison in which Olmert is serving. It is now being investigated whether Olmert used the documents to write a book he is currently working on. Olmert's lawyers slammed the punishment, denying that any classified documents were transferred.